Above pictures show lit diffusers. The diffuser comprises a diffuser sheet on its surface and LED lights under the diffuser sheet. In each picture, two diffusers have different appearances. The conventional diffuser shows many bright spots on the surface, which are casted from the LED lights. 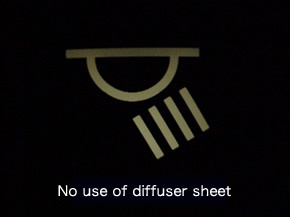 This means the conventional diffuser doesn’t diffuse LED light enough. 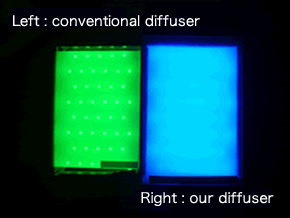 But our diffuser shows uniform distribution of light, meaning it succeeds in diffusing LED light. 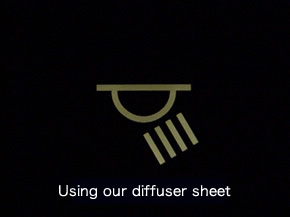 In relation between brightness and uniformity of diffuser, if a diffuser is brighter, it tends to lose uniformity. 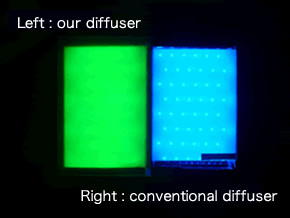 In relation between distance and uniformity, if a diffuser sheet is placed more distant form LED lights, the diffuser tends to diffuse LED lights well. In the above pictures, our diffuser sheet is placed at 10 mm apart over the LED lights. If you increase a distance between the diffuser and the LED lights, light distribution of the diffuser becomes more uniform. In our diffuser products, though the diffuser sheet is placed near the LED lights, our diffuser has very uniform light distribution. 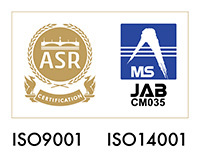 We also adjust uniformity, changing transmittance as a parameter. Materials of diffuser sheets are polycarbonate (PC), polyester (PET), and acryl (PMMA). Our diffusers are applied to LCD backlights, indicators, warning lamps, and lighting devices. We are using a luminance color meter (TOPCON BM-5A) to measure luminance and chromaticity on a diffuser surface, The left picture below shows a symbol of map lamp of automobile. 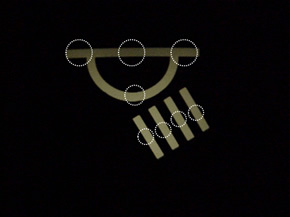 Eight circles in the picture show spots where luminance and chromaticity are measured. Referring to the measured values, we improve a diffuser sheet, adding several printing processes to it. Improved diffuser sheet shows uniform luminance and chromaticity in every part of the diffuser sheet, thanks to our expertise in printing technique. 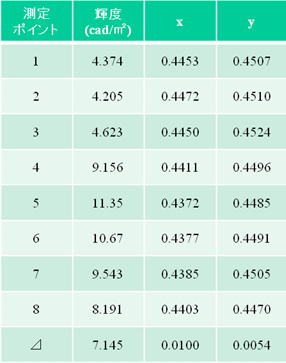 Luminance and chromaticity values measured by the luminance color meter are shown in the below tables. Left table shows our diffuser’s results and right table shows conventional diffuser’s results. 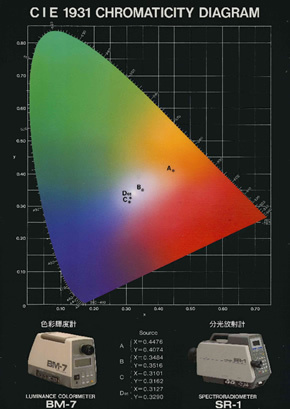 Our diffuser’s luminance and chromaticity values are within the allowable range of tolerance. But values without a diffuser sheet vary widely and are out of allowable tolerance. 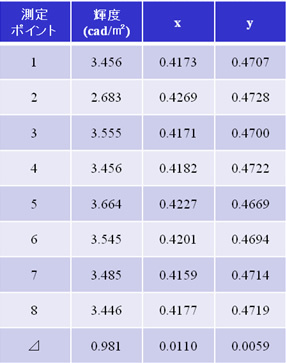 ＊ Values of x and y in the below tables show chromaticity at eight points on the diffuser sheet.